Mizuno Wave Horizon 2 are stability cushioned running shoes. 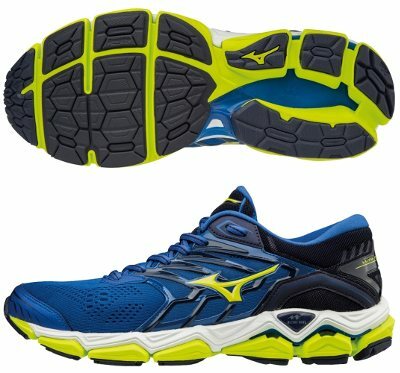 The revamped Mizuno Wave Horizon 2 is plenty of changes compared to first edition from Wave Horizon saga. Mizuno tried to introduce an intermediate step within stability's lineup between more responsive Wave Inspire 14 and more solid, the impressive Wave Paradox 4, kind of Wave Sky with pronation control. It is not clear yet if there is enough market share for Wave Horizon 2 and high price tag combined with not enough promotion seem not the best approach to boost sales. There are so many changes compared to first edition of Mizuno Wave Horizon that it would have made sense to name it in a new way although it would be more difficult to reach the 24th edition from the leading Asics Gel Kayano 24. Upper configuration is different depending on the area featuring multilayer mesh with multiple ventilation holes in the forefoot to increase breathability, a robust but adaptable frame embraces midfoot (supported as well by internal Dynamotion Fit strips) to provide secure and firm fit while heel counter keeps everything in place from the rear zone for improved stability. Heel collar is well padded offering plush comfort in line with what a runner can expect from medium/high price. Large tongue is partially gusseted to both sides to keep it always in the right place and prevent strange positions that may lead to discomfort. Stack height from Mizuno Wave Horizon 2 is slightly higher than average (including 12 mm drop) and the reason for that is to leave enough room for all technology behind plush cushioning and great stability. As a summary, midsole is composed of three main parts, from top to bottom: U4ic layer, expected SmoothRide Support Wave™ piece for pronation control and reliable U4icX platform. Outsole configuration is typical from Mizuno with big flex grooves in the forefoot for smoother transition which is not so decoupled from the rest because of reinforcements in midfoot area. As usual, harder rubber (X10) is used in more exposed areas to increase durability.